Looking out across the river towards the glittering brown rooves of Berat, Albania, is like looking backwards in time. The city is completely insulated from modernity. The two or three modern buildings, centers of municipal government and banks, lie on one side of the river, and set back a bit from the historical and residential center. As a consequence, with the foothills of the Balkans all around, there are few views of these buildings, and most windows reveal the same story. The large familial homes come cascading down the mountains, masterpieces of Ottoman architecture which have earned this place a UNESCO badge. Their rooves are tiled in an unusually dark color for Ottoman homes, a very strong brown flecked with black glistening spots, perhaps a pastel of tar. Stone fortresses and churches dot the landscape up higher, until even these give way to the land in which only goats hold sway. In any other locale this brown-black might be considered a very ugly color, but here it is perfect. The landscape is primeval, a mixture of browns and greens, jagged peaks of the Balkans interplaying with softer hills, worn down by the passage of millennia. Were it not for the smattering of homes in the hills, themselves centuries old, the valley would look like it belonged in the Jurassic. The Osum, the river which laps at the opal-white sandbars and lazes through the city, is itself the color of mud. The closest palette is perhaps the American Ozarks and the Mississippi, or perhaps the drainage of the Yangtze. I had spent a few days here, enjoying time’s absence. Hot mornings had seen me hiking and climbing, seeking out ancient Illyrian ruins in the hills and copses that lie outside the city. Roads and trails which might be found in other villages were completely nonexistent here. In central Albania, as it has been for millennia, the shepherds are the pathfinders and builders, and they have need for little else. Small settlements lie along the banks of the riparian valleys, supporting only a few houses and maybe a church. In the absence of more advanced services, the shepherds rely on one another for various skills and crafts as well as for transportation to the larger cities. I had driven into Berat from Ohrid in Macedonia, itself a cultural gem of the highest order, and the artistic heart of many Greek and East Orthodox traditions. I had avoided Tirana, choosing instead to sample the older cities in Albania’s interior. 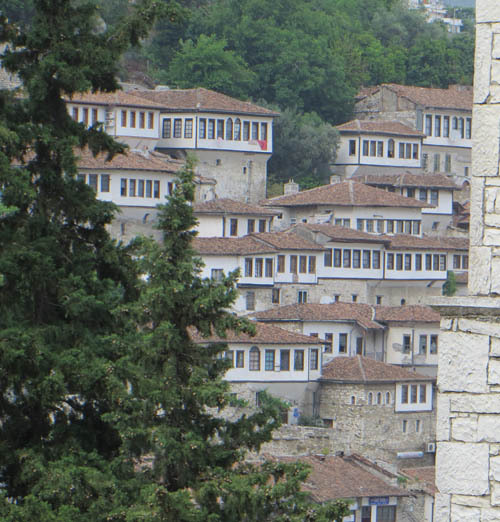 My aim now was Gjirokastra, Berat’s twin and rival to the south. By air, the distance between the two is a mere ninety-or-so kilometres, but my journey would take nearly 24 hours – and would teach me more about the kindness and resilience of the Albanian people than any time spent in a city ever would. I had planned this route out far in advance, and every map I consulted told me the same story. There were two main highways from Berat to Gjirokaster, one that first ran out towards the Adriatic before bowing back into the center, and another than ran a bit straighter, through the mountains. 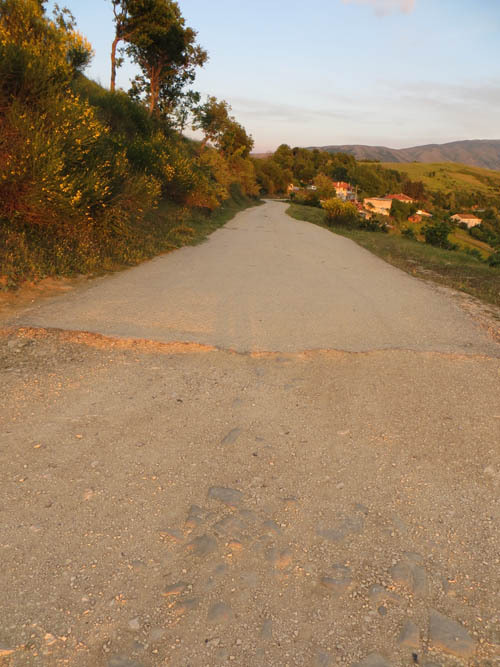 Even to this day, the roads have equal thickness when viewed on Google Maps. The route through the mountains therefore seemed not only more picturesque, but promised also a shorter drive. My passenger, an Australian named Nick who had signed on to ride with me, agreed. The route had an ominous start, which should already have told me that this was not the highway that was promised. My directions led me to an abandoned-looking cul-de-sac on the less-populated side of the river, just on the skirt of the mountains. The climb up was very steep at the beginning, at least a ten percent grade, which would be completely impossible for commercial trucks. Yet every time Nick or I rolled down the window to ask a local if we were on the right path, we received the same response: an ear-to-ear grin and a big thumbs-up. I don’t think I’ve ever received such a joyous response for the oft-annoying act of asking for directions, butchering someone’s beautiful language in the process. We continued to climb for at least an hour, covering what I think was roughly three thousand feet in elevation gain. Just when I thought it was impossible to go much higher, the pavement slowly began to disappear, yielding to a dusty dirt road not wide enough for two-way traffic, necessitating the carefully planned yielding and passing that those accustomed to driving in the mountains will know. In utter disbelief that this could be a road worthy of the same map-thickness as an American interstate, I flagged down the few vehicles that we passed, descending into Berat from various mountain villages. They all gave the same response, grinning and pointing upwards. “Permit”, they would say as they pointed, as if to suggest that it was possible, it could be done. This is a homophone for Permet, the largest town along this highway before exiting onto a road back down to Gjirokaster and civilization, but it still rings in my ears — “Yes, this is indeed a road, you are permitted to attempt it”. One young couple even clapped for us. Even if all had gone smoothly, I would not be able to forget that drive. I’d like to think I’ve seen a majority of the scenic roads in the American West, and I’ve never seen anything quite like this. The road clung tenaciously to the hem of the mountains, just close enough to perdition to reveal a constant view of the river and the valley a few thousand feet below. The palette was unique – Albania has a color, whose beauty is difficult to describe without accidentally conveying a false sense of boredom or ennui, a gray-brown-green like the glittering rooftops in Berat, which seem natural, primeval, fecund. It somehow looks like the first terrain colonized by Man, and as we finally summited and left even the smallest villages behind us, now slowly navigating our way around large rocks jutting out from the road, it would be easy to mistake this for either the beginning or the end of time. The only traces of history lay on the leeward side of the road, where rectangular stones and decaying wooden planks marked an earlier iteration of this same path, perhaps an old Ottoman road from centuries before. Just as I was beginning to like the idea that this drive might take three or four times longer than expected, the oil light came on. At this point my ego demands an interjection, in which I claim that I have driven many times on dirt mountain roads, know how to navigate a boulder, know how to protect the all-important viscera dangling on the underside of the vehicle. Perhaps I would blame Chevy for designing an SUV with such a low clearance. But, more likely, the distraction of the view and its interesting cameos – herds of goats and sheep, the occasional paths perhaps diverting to local villages, perhaps remnants of old shepherd’s paths – drew my attention just long enough to crack the sump. I pulled over frantically, trying to avoid seizing the engine. Stepping out into the summer heat to look around and assess the situation, we realized just how screwed we were. My first thought was actually “Wow, we could die out here”. It had been at least two hours since we had passed another vehicle, and most of them were coming down the mountain into Berat from villages halfway up – traffic going the other way was much more rare. Having little alternative, I left Nick to wait with the car in case somebody came by the road, while I set out to scout ahead and see if perhaps we were within walking distance of, well, anybody. It was early afternoon, hot and dry. I was beginning to panic. The whole drive should not have taken more than two hours, and so I had not stored any food or water. We had a few small bottles between the two of us, probably half-depleted. In these circumstances, I could only walk a few miles before the sun would force me to turn back, and if I found nothing, we’d be forced to hole up in the car until someone found us, which could very well be more than a day. Rolling back down the mountain in neutral necessitated power brakes, which would necessitate an active engine, a definite impossibility. At this point, my Albanian miracle occurred. I had only made it perhaps a few kilometers when, in a green hill above me, I sighted an older man leading his flock. Waving desperately, I got his attention. My Albanian was only for “survival” – by which we usually mean locating a toilet and ordering in a restaurant – and not for actual emergencies. Our idiom eventually settled on a few words in common in Italian. I speak Spanish, and was relying on the overlap, while he had studied Italian in school many decades prior. Besides this, our communication relied on sign language, after which he would ask “Capito?”, which constituted the majority of his vocabulary. It was pretty easy to convey the idea that our car had broken down, and, whistling to his goats, we headed back to the car. He took a good look at Nick, sitting in the dust to escape the hot car and the sun, and clucked at us, shaking his head. Then, facing down the mountain, he stuck two fingers in his mouth and issued a loud whistle. As if in a fairy tale, a flurry of activity came forth. Whistles echoed back from all over the valley. Within minutes, two more shepherds had joined us, and began discussing the problem at great length. Different oil weights are universal, so I understood that we were after a bit of oil that would be appropriate for our sad Chevy. The three men then began shouting for a friend of theirs. This was how they conducted their network; although they would go for a day or more without seeing each other, they knew where the others might be, and knew if they yelled loud enough, they’d get what they want. After a few minutes, the individual in question appeared, and after assessing the situation he disappeared and reappeared with a Pepsi bottle full of beautiful golden oil. At this point I tried to interject, to explain that the sump was cracked, but it was too hard to communicate, and they were too eager to help. Nearly pushing me aside, they popped the hood and poured the beautiful honey-colored salvation into the engine. I watched sadly as it quickly ran out the bottom, and as I pointed, the old man sighed too. After a long discussion, most of the shepherds shook our hands and went their separate ways. There was nothing to be done. Somehow, we would have to be towed down the mountain. I asked if we could somehow call a tow truck up here, and the old man laughed. With the steepness of the dirt road, it would be completely impossible. Besides, none of them had phones. His son, it was explained, could tow us in. I followed the old man back to his home, further down the hill. There, Nick and I were vigorously introduced to his two daughters (granddaughters? ), both single. They entertained us, nervously fed us and brewed coffee while the old man relaxed in a rocking chair. A young boy rounded up the goats, which had obediently followed us all the while. Their home was basic, yet cozy, surrounded by perhaps a few acres of arable land which, combined with the livestock, must have been just enough to eke out an existence. Every half-hour or so, I would ask about the status of our tow, and for a few hours I got the same response: “Don’t worry”. Time flows differently up there in the mountains. In no mood to haggle, I eagerly accepted. At long last, with the sun hanging low in the sky, we set out. I had faith in the old diesel Mercedes that dragged us along – I had owned the same model a few years before. It belched black smoke and needed to stop every mile for a cupful of coolant, but I knew it had the staying power we would need. Unfortunately, I had not fully understood that we were not yet completely over the summit. In some stretches, we strained, just barely making it over the edge, to the cheers of all (due to lack of power in the Chevy and lack of capability in the Mercedes to produce air conditioning, windows were down throughout). In others, we couldn’t make it. Fortunately, we had begun now to encounter civilization, the far-flung exurbs of Permet and our new target, the “city” of Tepelene, the nearest spot with a repair shop. 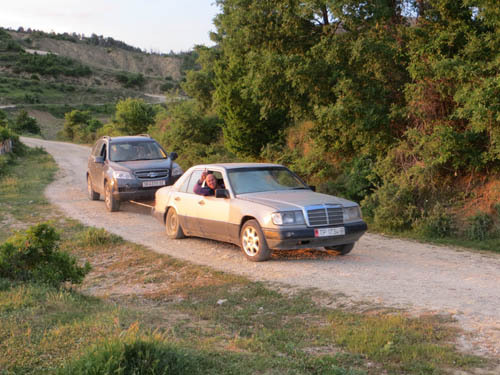 When we were incapable of climbing a hill, we performed an action I have never seen before or since – a three-car tow. Why we did not unhitch the Chevy and hitch it to whatever truck had taken pity on us is entirely unclear. 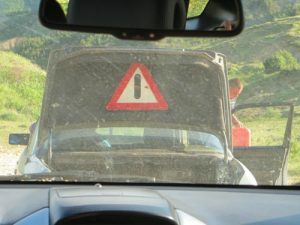 But several men had their manliness confirmed by towing two vehicles and 5-6 individuals up some steep pitches. At long last, with the parting rays of sunlight, we reached the pavement. I have never seen such a beautiful sight. Leaping out of the Chevy, Nick and I kissed the sweet divide between the mountains and humanity. Within another hour or so, now quite dark, we attained Tepelene. Tepelene itself is quite beautiful, and worthy of a visit. A pleasant stretch of the Vjosa runs along it, with intervening sandbars and broken bridges, Berat in miniature and for exactly that reason somehow more authentic. In another version of the story perhaps we would have stayed longer, fishing for trout in its rushes, admiring the old churches in the hills just outside. The next day, after repairs, we were off. Though we reached Gjirokastra within an hour, somehow it rang hollow. Walking through the ornate and beautiful streets, I found myself more often than not thinking about events of the previous days. I had seen the heart of Albania, and it was not in these Ottoman structures, built by invaders, nor was it in the famous alabaster bunkers and other remembrances of the Hoxha period. It lay in the mountains, in small groups of shepherds who still maintained the collective lifestyle, the village lifestyle, ensuring one another’s prosperity and, when the need arose, going out of their way to help a stranger.